Long story short, her Catholic employer suspended her because her post was "completely inconsistent with our policy and position as a Catholic Institution." I have absolutely no clue how it could be "completely" inconsistent since the Catechism indeed does teach against homosexual acts. Nonetheless, for a short time, some of us held out hope that the local Bishop would come to the rescue. It never happened. In fact he doubled down on what his subordinates had said about the teacher. The teacher’s comments were disturbing and do not reflect the Church’s teachings of acceptance. Immaculata High School has reached an understanding with Mrs. Patricia Jannuzzi. It is the School's position that a Catholic school teacher must always communicate the faith in a way that is positive and never hurtful. Tone and choice of words matter and I trust Mrs. Jannuzzi's stated promise to strive always to teach in a spirit of truth and charity. As long as Mrs. Jannuzzi goes back to her job and communicates in a way that is positive and never hurtful, mindful of her tone and choice of words - she can stay. For that matter, every Catholic teacher in that Diocese better watch their P's and Q's or they could find themselves in the same predicament. The bishop and his monsignor have effectively muzzled all of their Catholic school teachers. It doesn't matter if they were defending the church's teaching on any topic, or if the articles they are replying to are controversial and inflammatory. In fact, NOT ONCE, was it ever mentioned that Mrs. Jannuzzi didn't initiate the discussion, but rather was responding to a very negative article by gay activist, Dan Savage. The authorities in the Diocese of Metuchen don't buy into the "They started it!" Defence. But what kept puzzling was me was, what exactly did she say that was "disturbing" and how should one communicate in these forums in a "positive way?!" The Bishop never used his position to teach on that one. The lesson I came away with was, "Teachers in the Diocese better just get off Facebook, or at the very least, really double down on those privacy settings." It's a lot like reprimanding a toddler for a certain behavior without clarifying what the right behavior should be! But I think the problem is bigger than that. Really any Catholic, anywhere could be reprimanded or have their comments misconstrued at any time for things written in the Facebook Forum. And since we can't really count on church officials having our back, what's a FB Catholic to do? I actually learned the answer to that over 10 years ago when I used to debate Pagan Moms on the now defunct AOL message boards. During those golden year when I was first learning to debate and discuss online, those ladies really held my feet to the fire! They challenged me and pushed me to be better in my online postings and I think it helped to make me a better debate participant. So here are some ideas, gleaned from the lessons and tips from my former Pagan Friends, on how to post safely on controversial matters, on Facebook. 1. Chose your battles! If you feel you have to reply to something someone posted on Facebook take a deep breath and walk away. If you still feel like replying 10 minutes later, then proceed with extreme caution, and only on a computer or tablet with an actual keyboard! 2. Write in complete sentences. The worst thing about Mrs. Jannuzzi's post, I think, is that she was probably replying from her phone or tablet. Clarity is key, and it's hard sometimes to do that from a portable communication device. If you can't write it from your computer, take a pass on it. 3. Avoid broad brush pronouns! Mrs. Jannuzzi took on the mysterious "they." Surely not all of any group is even aware of what the 14th amendment is, let alone that they should be going after it. If you must use a pronoun at all say something like, "some." 4. Avoid logical fallacies. Mrs. Jannuzzi used the slippery slope fallacy. You can get called on that one, every time. 5. Instead state it as an opinion, i.e. "In my opinion, if this happens, then this could occur," or "Based on my experience, this could happen if this occurs." It takes you out of the prognostication business and takes that big pointy finger out of the face of a large group of people! 6. If you must write something like, "They want to re-engineer western civilization" have an article, or a reference or something else to link to, so that readers know you're not just going on a rant, but have actually done some homework and can prove it! In fact, sometimes it's better to just link to another source and let everyone figure it out for themselves! 7. Refer to the article you are responding to - A LOT! Mrs. Jannuzzi got nailed because there was no mention at all of Dan Savage or any of the vulgar things he wrote. Keep the main article the main focus, or else all the attention is going back in the wrong direction! 8. 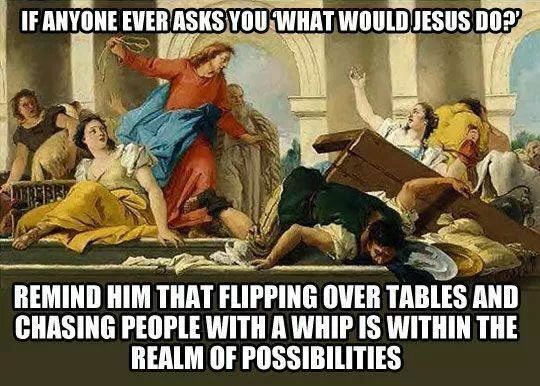 It wouldn't hurt to throw in a quote or two from or about Jesus either. It seems the people in New Jersey don't seem to remember that Jesus wasn't crucified for being a nice guy. He was crucified for being stiff in his opinions. If you need a quote, here is one of my favorites!